I just finished the applique on this quilt. The ladies in my group each made a bunch of the same color blocks in the center and traded with each other. 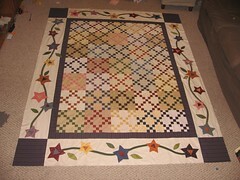 I made mine with more blocks and did the applique in the borders. It was a really fun project and I am glad that I am done because I will probably be very busy from now on since I just got called to be in the Primary Presidency in our Ward (2nd counsellor). I will miss playing the piano for primary, which I did for the last almost 7 years. I got lucky they left me there for so long, and it was the best calling ever. BTW, this is not John, I just forgot that when you post from flickr it uses the flickr account, which is John's.